I have to write this because I feel completely alone on the subject. I know not everyone will agree, and thats why we have comments. I am down to discuss this. Also, if I end up writing more defense posts, I’m calling the series “Indie Fence” because puns have amused me since the moment my daughter was born and ohGodhelpmewhathaveIbecomebesidesobviouslyafatherbutseriouslyamIcursedtonowenjoythesamedadjokesIusedtorollmyeyesatwhatislifenowifnottorture. I love the Wii U Pro Controller. When the Switch was announced, there were plenty of comments praising the placement of the analog sticks. Gamers all around seemed to love the fact that Nintendo finally off-set them, similar to XBOX or Nintendo’s own GameCube. Other than Switch’s sticks being akimbo (or assymetrical, if you’re the type of person who remembers the meaning of akimbo) and Wii U’s being parallel, you can see the similarities. They moved the sticks slightly out and the D-Pad/buttons slightly in. They claimed this was for comfort, which makes sense when you think about the way thumbs move diagonally (and not by dislocating and sliding straight up and down). Another change made, that you can’t see in the pictures, but can trust my all-knowing wisdom on, is the addition of grips to the back (similar to the “Puppy Controller on Switch). Again this change was made for comfort, as the smooth flat surface of the prototype would be uncomfortable after extended use. The Wii U GamePad Is Different. Here&apos;s How. So Nintendo made all those changes to the Wii U GamePad in order to increase comfort. Then they unveil Switch and what does it feature? A smooth flat back and now-Akimbo (eat it, comma fuckers and grammar Nazis) analog sticks straight above/below the face buttons. I get it. The GamePad might surprise with its level of comfort, but it can’t be called sleek. Sleek sells. Whereas comfort didn’t. What does all this have to do with the Pro Controller? I’m getting there, you impatient baboon. Here, have another controller pic to tide you over before I break down the Pro’s greatest strength, Switch’s greatest folly, and why you’re wrong, I’m right, neener neener neener. That FPS Master, while totally ugly now, blew me away when it was announced. Never take your fingers off the triggers and sticks! Master any First Person Shooter! Granted, you’ll have to learn how to press face buttons with your middle and ring fingers. That part means it wouldn’t catch on with the mainstream- hence why you never heard of it (I would still like to try it out). 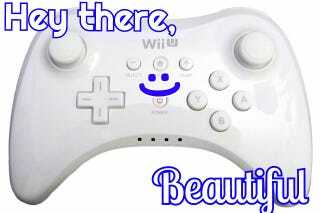 Now look at the Wii U Pro controller. Like the XBOX, your left thumb stays in the resting position. Unlike it, so does your right. So, maximum comfort with shooters. Also, with the face buttons and D-Pad below, your grip changes for the genre of game (3D Action Adventure/Shooters- XBOX grip, 2D side scrollers/fighting games- PlayStation grip). For those of you without keen, godlike eyes, I gave the buttons XBOX colors to help illustrate my point. You see, like the clothes of 90's Hip-Hop sensation Kriss Kross, Nintendo’s buttons are backwards. This is a trend that started with the SNES and has since carried on for every home and portable console since, with an exception for GameCube, whose layout was a brilliant idea (buttons were easily distinguished, all could be reached by just rolling thumb) that nobody liked. This layout trend has persisted all the way to the NS. Now, I want you to imagine some things. Picture how a thumb naturally moves, then picture a 360 controller. Now, think about the motion and distance to move your thumb from the right stick, and place it across A & X (tip on X, middle thumb in A). Now picture doing the same on the Pro Controller. Though reversed, it’s the same motion. Finally, try to imagine that on Switch. Besides breaking your thumb to slide straight up, pressing the same buttons on NS is like pressing B&Y on XBOX or O&^ on PlayStation. This matters because cross platform games will not just use the standard layout on Switch. They will match letter for letter with XBOX. So I guess my point is: The Wii U Pro controller is dope AND smart. It may seem off to people who are used to PlayStation or XBOX layouts, but dig a little deeper and it makes total sense. Both comfort wise, and because Nintendo has stupid face buttons. I will admit it’s too mushy though.